Part four in our eight-part series on fragrance related holiday gifts features various and sundry coffrets and gift sets. Do add any of your own recommendations in the comments! 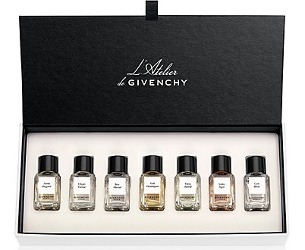 From Givenchy, 5 ml bottles of seven fragrances in the L’Atelier de Givenchy series (Néroli Originel, Chypre Caresse, Bois Martial, Oud Flamboyant, Ylang Austral, Ambre Tigré and Cuir Blanc). $140 at Barneys. From Christian Louboutin, the Parfum Collection, with 5 ml Parfum dabbers in Tornade Blonde, Bikini Questa Sera and Trouble in Heaven. $95 at Sephora. 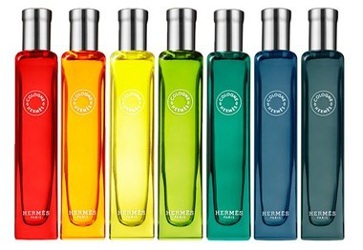 From Hermès, the Cologne Collection travel set, with 15 ml bottles of seven fragrances (Eau de rhubarbe écarlate, Eau de mandarine ambrée, Eau de néroli doré, Eau de pamplemousse rose, Eau d'orange verte, Eau de narcisse bleu and Eau de gentiane blanche. $224 at Nordstrom. 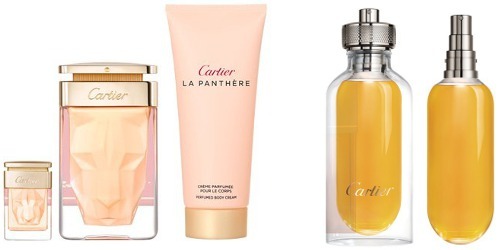 From Cartier, Hers ("A three-piece set featuring the feline-floral accord of La Panthère", $144) and His ("Experience L'Envol de Cartier with this two-piece fragrance set featuring a spray bottle and a refill", $175) gift sets. Also at Nordstrom. From L'Occitane, the Graceful Arlésienne set (scented with rose, violet and saffron). Includes Eau de Toilette, Shower Gel, Body Milk, Soap and Hand Cream. $78. From Annick Goutal, the Noel Miniatures Gift Set with Eau d'Hadrien in 15 ml Eau de Toilette, 50 ml Body Lotion and 100g soap, plus a 35g Noel candle. £41 at Escentual. 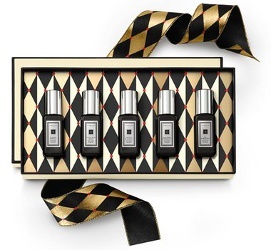 From Jo Malone, the Cologne Intense Collection, with 9 ml bottles of Tuberose Angelica, Velvet Rose & Oud, Dark Amber & Ginger Lily , Oud & Bergamot and Incense and Cedrat. $150 at Blue Mercury. From Olfactive Studio, the Discovery Kit, with 4 ml minis of seven Olfactive Studio bestsellers: Flash Back, Still Life, Lumiere Blanche, Autoportrait, Panorama, Chambre Noire and Ombre Indigo. $50 at Arielle Shoshana. From Sarah Jessica Parker, a Stash gift set, with Eau de Parfum, Hair & Body Elixir Oil and Rollerball. $85 at Ulta. 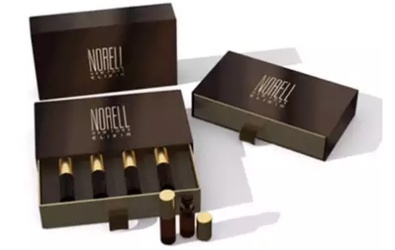 From Norell, the Elixir Accord set: "Four beautiful accords that can be worn each alone, together, or to enhance NORELL ELIXIR." With White Floral Accord, Patchouli Cashmeran, Citrus Water and Musk Tobacco. $60 at Neiman Marcus. I still need to get myself to Ulta and try Stash! Just do it already! I haven’t bought a FB yet, but will do so within about a week. It will instantly be on my best of 2016 list. I know, I know! But hate Ulta and also hate going down the strip mall highway…eventually, I’ll do it. It looks so darned cheerful, doesn’t it? There’s a lovely Diptyque discovery set available for $115 from a bunch of different retailers – 7.5 ml sprays of 5 different scents. I . . . may have purchased it for myself as a reward for hosting Thanksgiving. Ha, might you have? Enjoy, and thanks! Worth attention are also Le Galion miniatures, they’re 6,5ml splash bottle each. As I keep mentioning, I like the April Aromatics discovery set. It’s available at Luckyscent, which has many other interesting sets. They’re not all listed in one place, though. You have to try different search terms or look at each brand page. I noticed that Bloomingdales at Tysons has the Penhaligon’s mini sets, at least they do at Tysons. Bulgari does a set of travel sprays for Le Gemme. 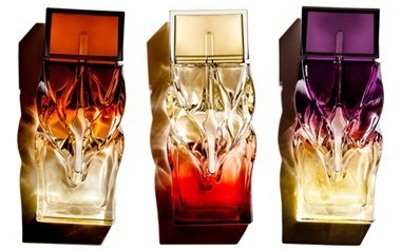 I’ve only tried Ashlemah, which was something like Prada Infusion d’Iris but warmer and with more musk. Worth a sniff if you like big feminine perfumes. Yes, and also, the April Aromatics Chakra set looks like great fun, esp. for anyone really into yoga. Ah, I haven’t tried that yet. That does sound like fun! The Jo Loves Discovery Set comes with a Shot Box of 9 atomizer samples and a coupon for either a 50 or 100 mL bottle. The 50 mL version is $160. I will find out redemption instructions once I receive my package. I got my Jo Loves Discovery Set! The atomizer samples look just like the ones for Jo Malone. I have 3 options to redeem the certificate for one 50 mL bottle: online, via phone or in-person. Shipping is free! If I’m anywhere near the London boutique at the end of the month, I may just pick it up in-person! Oh lovely — and do you like any of the scents? I will try them over the weekend and report back on the LWP thread!